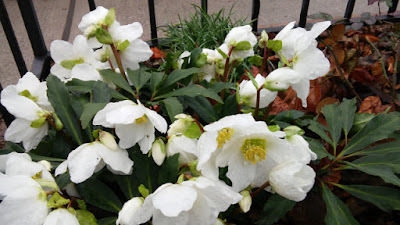 Hellebores bloom in the winter and early spring. Barbara Brown’s plants are now in full bloom (it’s no wonder that she won the 2014 Streetscapes award for her garden!). There are, as well, hundreds of bees visiting the plants, a result of their flowers and the extraordinary warm weather. If you walk along the north side of Amelia, you’ll see them in her garden at 62 Amelia. Thanks to both Ron Hume and Ann Ames for telling me about them. For 63 years, the McDermotts have supplied our neighbourhood with their Christmas trees from a temporary lot next to No Frills at Spruce nd Parliament. The sales guy is Peter Vettorel. Edward Brown has written a great story about their venture in Torontoist – many thanks to the Cabbagetown Residents Association for spotting it. Click here to read it. 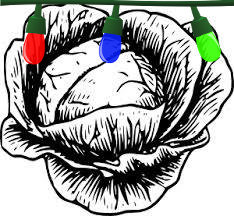 The Cabbagetown Residents are holding a contest to reward the household with the most popular Christmas lights display. It continues to January 10. To nominate a home, post a photo on the CRA’s Twitter or Facebook or email them – click here for all these details. Photo: Toronto Muses – not another Toronto gardening blog. The flower show in the Conservatory (Carlton between Sherbourne and Jarvis) is now open. There will be extended hours next weekend, December 26 and 27 – open to 7 pm. Normal hours are 10 am to 5 pm daily to Sunday January 10. 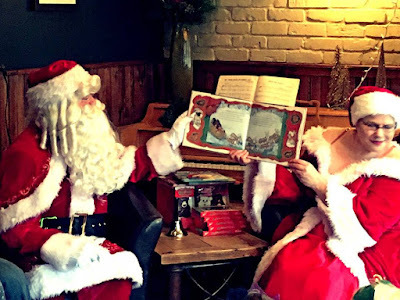 Soulpepper’s Christmas concert featuring guests like Jackie Richardson, soprano Patricia O’Callaghan, Mike Ross, Albert Schultz and the Heavyweights Brass Band. December 26, 7 pm. Soulpepper in the Young Centre (Tank House Ln, Distillery). For all the details, click here. He was at The Irv (195 Carlton). And he and the Missus dropped by Stout Irish Pub (221 Carlton). 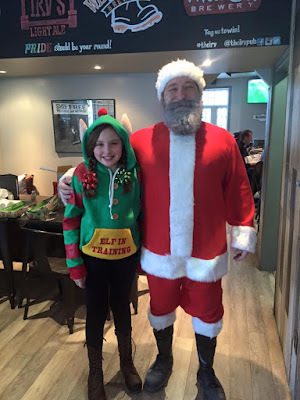 The annual Christmas Day dinner at Cranberries (601 Parliament) is one of the season’s most pleasant events. The meal is delicious. The price is modest. The crowds fill the restaurant. Two seatings – at 5 and 7:30 pm. Soup or salad, a traditional turkey entrée with mashed potatoes, gravy, homemade stuffing, fresh veggies, a dinner roll – and of course, cranberries. Apple pie and ice cream for dessert. $28. Pop by the House on Parliament from noon to 4 pm while your turkey is in the oven. 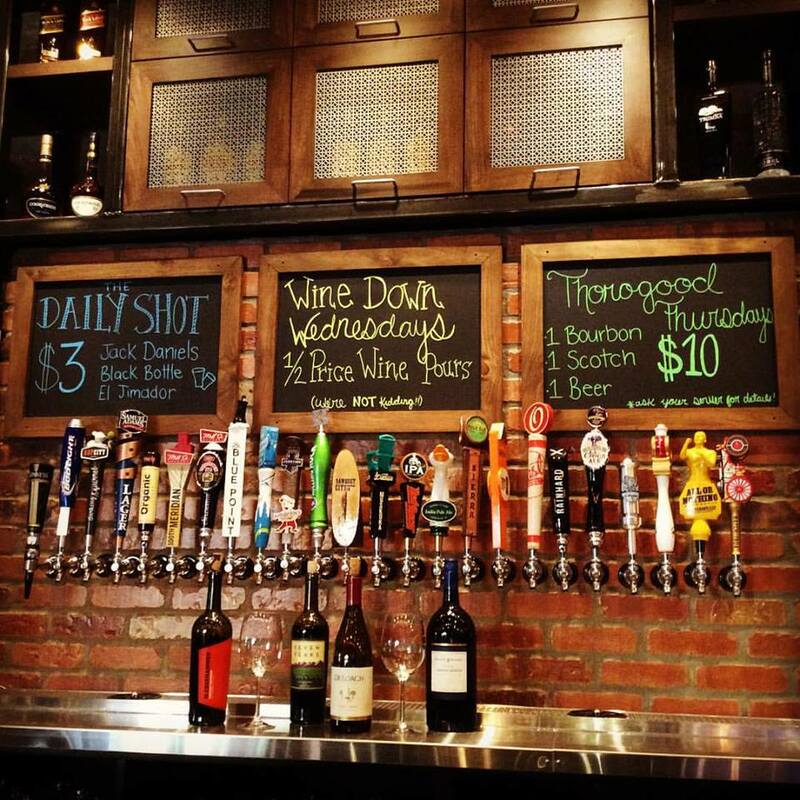 Enjoy a drink – the bar is open. The kitchen staff is taking the day off so the menu is a limited selection of cold snacks. Special a la carte dishes and wine and champagne. 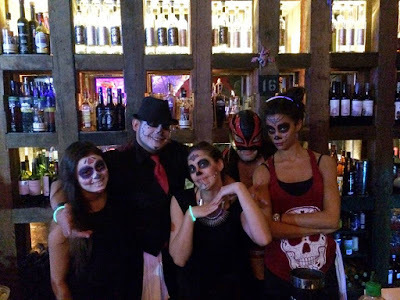 35 Tank House Ln, Distillery, (416) 203-2632. The New Year’s Eve dinner menu is another of Cranberries’ fine offerings. It’s a la carte with individually priced courses. Appetizers include tomato and shrimp bisque and a mixed green salad. For your main course, there’s chicken roulade, seafood pasta or horseradish crusted rib steak and for dessert, dark chocolate Grand Marnier mousse. 601 Parliament. 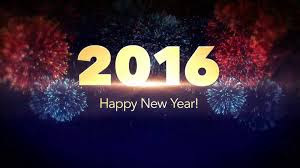 Rockyard will be playing at the Dominion Pub & Kitchen on New Year’s Eve from 10:30 pm. Party favours, special menu, bubbly at midnight. No cover. (416) 366-5555. 500 Queen E.
Mexican eats, spicy beats. The party starts at 10 pm. Food stations and DJ dancing. Early bird tickets at $32.50, general tickets at $43 and tickets at the door, $53.60. (416) 203-2121. 18 Tank House Ln, Distillery. 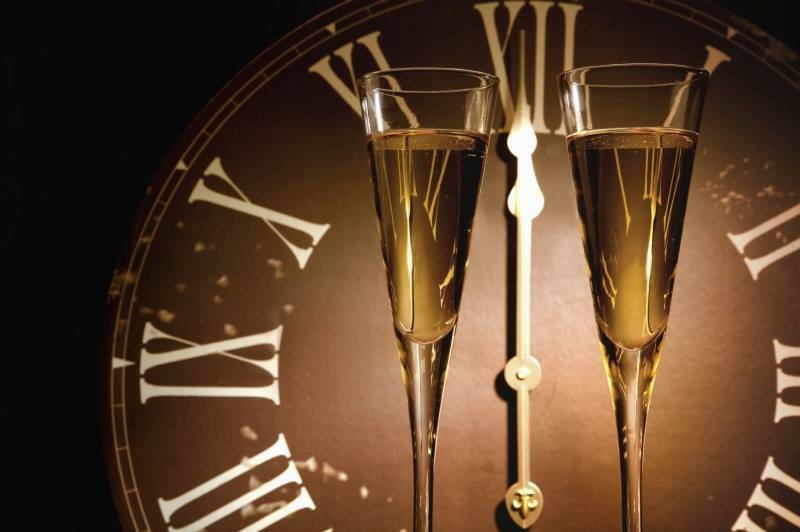 On New Year’s Eve, ring in the New Year with F’Amelia’s Table D’Hote. It’s a three-course dinner with amazing choices and you can add on a Salumi board at the start and a cheese board to finish. $59. Check out the details here. (416) 323-0666. 12 Amelia. 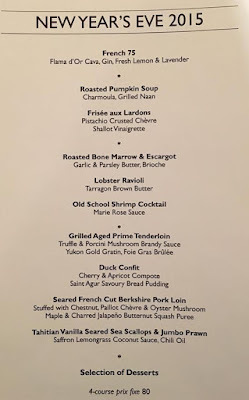 Four-course dinner featuring beef tenderloin, duck confit, pork loin or scallops and prawns along with soup or salad, second course with escargots, shrimp cocktail or ravioli and a selection ofm desserts. $80. From 6 pm. 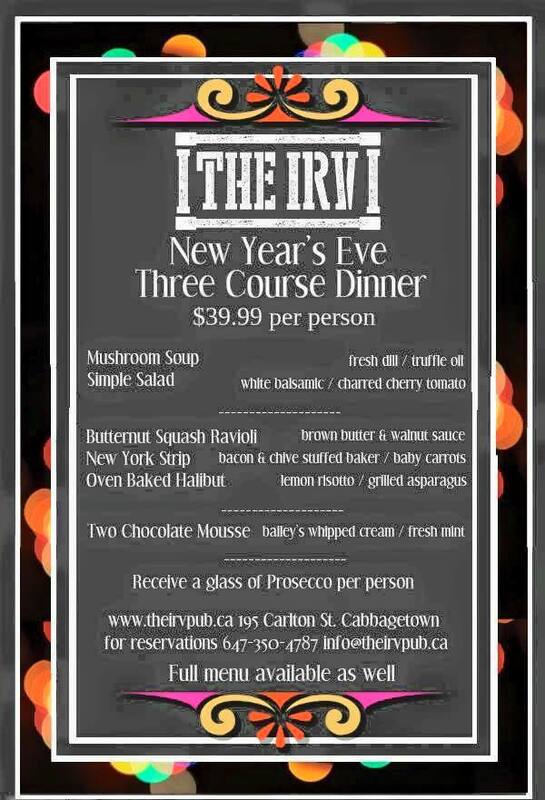 Call for reservations, (416) 925-4074. 454 Parliament. 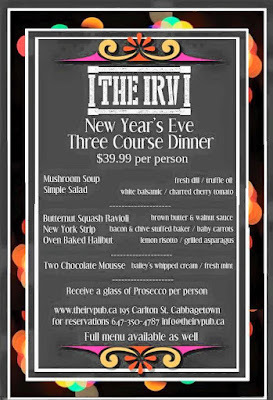 The Irv offers a three-course dinner complete with a glass of Prosecco for $39.99. 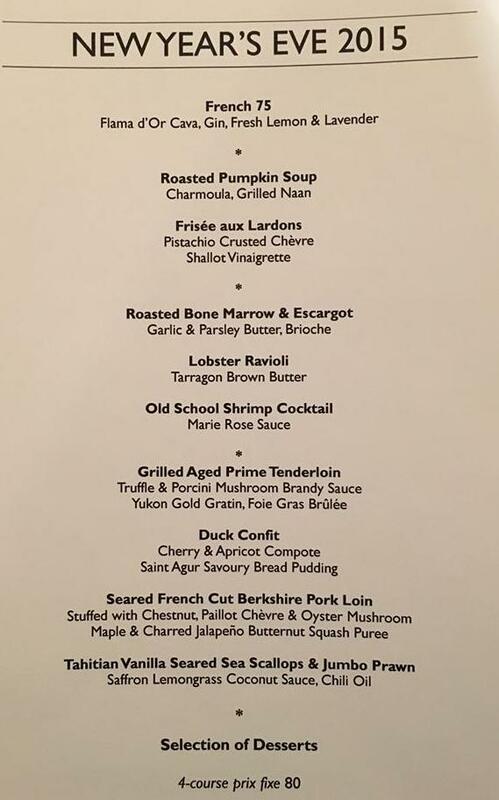 The menu includes mushroom soup or salad, butternut squash ravioli, New York strip or oven-baked halibut for your entrée and two-chocolate mousse for dessert. From 6 pm. (647) 350-4787. 195 Carlton. 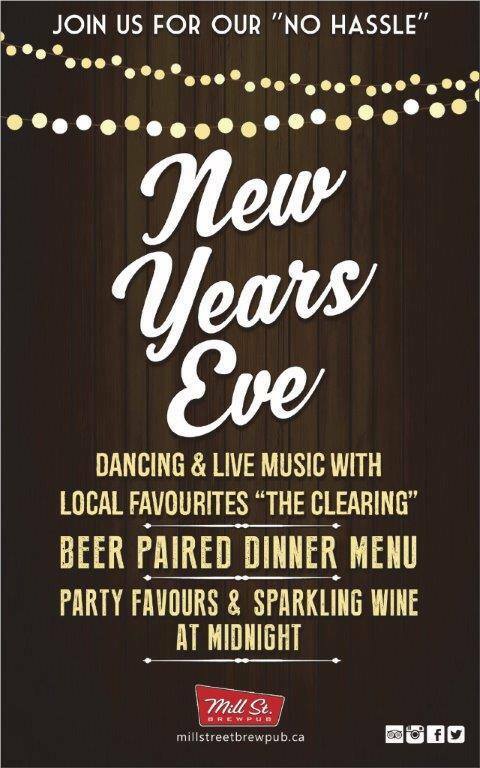 A no-hassle New Year’s Eve with a beer paired dinner, dancing, party favours and sparkling wine at midnight. Entertainment by The Clearing. (416) 681-0338. 21 Tank House Ln, Distillery. 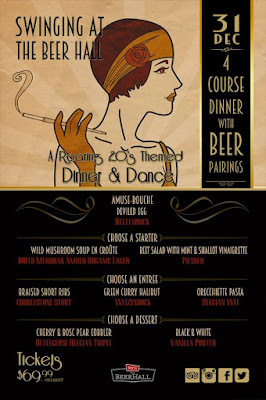 “Swinging at The Beer Hall” is a roaring ‘20s themed dinner and dance. The four-course dinner includes beer pairings, wild mushroom soup or beet salad for starters, braised short ribs, curried halibut or orecchiette pasta for your main course and cherry and bosc pear cobbler or a black-and-white for dessert. Tickets are $69.99. (416) 681-0338. 21 Tank House Ln, Distillery. 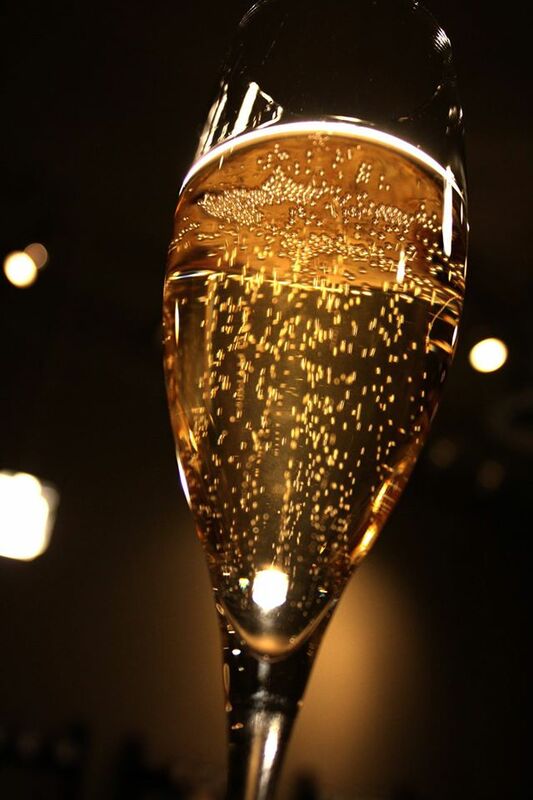 On New Year’s Eve, enjoy Peartree’s three-course dinner. Start with shrimp, mussels, soup or salad, select steak and lobster, grilled halibut, chicken breast, seafood classic or vegetarian agnolotti, and your choice of dessert. $70 for two. 507 Parliament. (416) 962-8190. Ring in the New Year with your friends and family at Stout (221 Carlton). 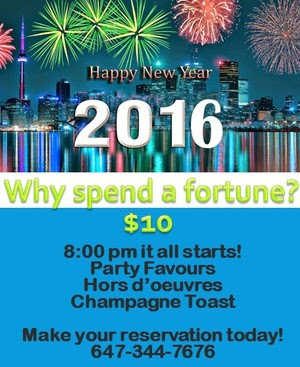 A $10 ticket buys your champagne, hors d’oeuvres and party favours. 8 pm to 2 am. (647) 344-7676. Most clubs and restaurants are closed. Call your favourite to confirm holiday hours. Christmas – Cranberries and House on Parliament are open. 10 pm, Dinner, DJs, dancing, tickets from $32.60 (early bird). 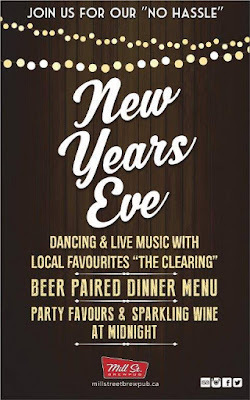 6 pm, No Hassle New Year’s Eve party with The Clearing, dancing and a beer paired menu, bubbly at midnight. 8 pm, New Year’s Eve party with bubbly, hors d’oeuvres and prizes. $10.